I have decided to take on the One + Four = Life‬ picture challenge by Pip over at Meet Me At Mike’s. Check out her post here for the deets, but the basic idea is to show your life in four pictures per week. 1) New Notebook: I got a new notebook to celebrate my ‪ new job‬! Quitting my job a few months ago was a hard and scary decision, but I knew it was what I had to do to move forward. Thankfully, with a strong and positive network, I landed a part-time gig with a great group of people. This notebook was my gift to myself and the future I’m building. 2) My girlfriend just gave birth to a new little man on Mar. 30. Photo creds to her, but she was showing me his first trip to the doctor, complete with the blanket that I knit him! 3) I spent a lot of time this Easter weekend in Toronto. Friday was a trip with my future in-laws, taking in my first lacrosse game. Then, I went back for Saturday and Sunday to watch my man play in the Hockey ‪Summit Of The Arts‬ ‪‎tournament. It is a great event that happens every Easter weekend, and the sense of community is phenomenal. I met lovely people, stayed at the Hyatt Regency (complete with a view of the ‪‎CN Tower‬), saw Sean rock out on stage at the ‪‎Horseshoe Tavern‬, and got to see him and his team celebrate taking home the trophy for their division. 4) I am a ‪self-proclaimed ‎Starbucks‬ addict, and am loving ‪La Boulange‬ and their melty, warm, delicious baked goods. This picture signifies my last indulgent treat for a little while. I need to keep striving for my ‪‎healthy living‬ goals, so that means a major cut-back of the sweet stuff. Wanna join the One + Four = Life picture challenge? It’s simple! 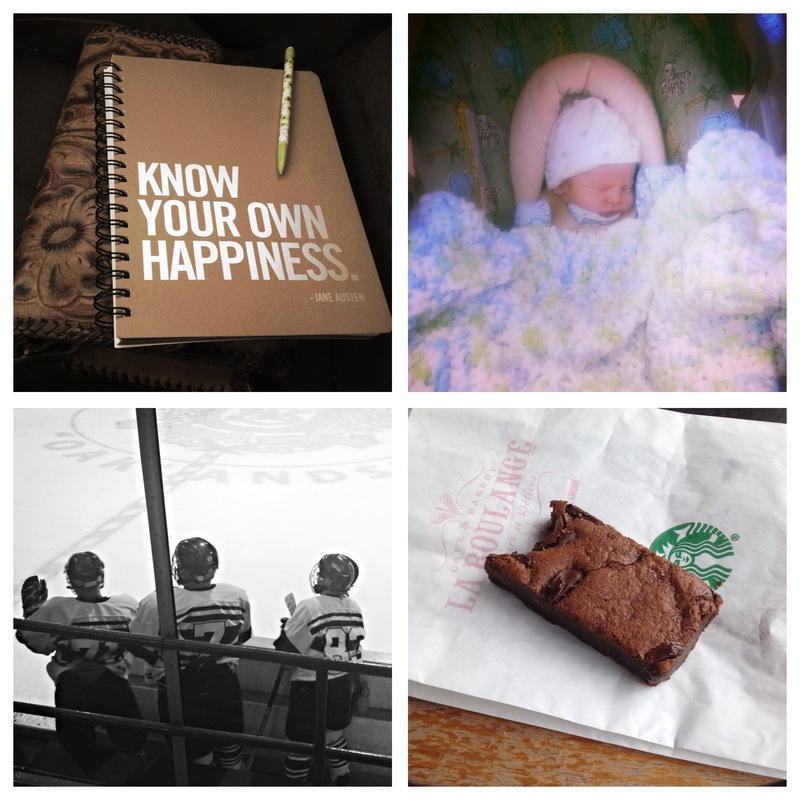 Post four pictures: on your blog, Instagram, Twitter, Facebook, Pinterest, Google +, wherever! Then, head over to Meet Me At Mike’s, find Pip’s weekly One + Four = Life post, and add your link into the comments section. Easy, peasy, and a great way to document fun times.